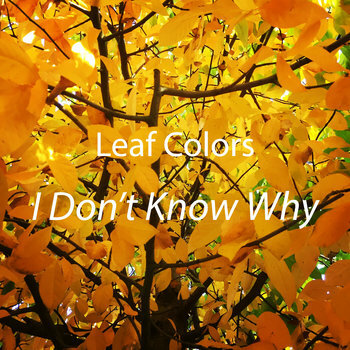 Leaf Colors is a musical artist who embraces the do-it-yourself approach to creation, acting as the songwriter, singer, instrumentalist, producer, and art designer for most of his releases. After failing to hold a band together, and failing to hold himself together, Leaf Colors has emerged as a jack-of-all-trades. And while clearly a master of none, the results nonetheless showcase a versatility and talent for singularly developing an idea from inception to fruition. Leaf Colors draws upon a wide range of influences and channels them into a mishmash of Indie, Rock, Folk, Americana, and Pop that sounds simultaneously modern and timeless, as personal as it is derivative. Also notable are the so-honest-it-hurts lyrics that encapsulate the universality of the human experience. Leaf Colors is unafraid to explore the pain of life's trials, tribulations, and existential crises, with the hope that doing so will reveal the silver lining surrounding them. Much like the deciduous trees that lend their namesake to this pseudonym, Leaf Colors is in the process of shedding their emotional leaves and using them to paint auditory landscapes -- each one leaving the listener eager to find what will come next. Listen on Spotify. Download on iTunes and Bandcamp.